As a hungry teenager, I craved bánh mì every morning before going to school. In those days, bánh mì was a luxury, and two bánh mì could cost a day’s work, even though the traditional offering from a small town in central Vietnam was simple: bread toasted on warm coal, pate, mayonnaise, meatballs, a bit of shredded pork, cucumber, green onion, cilantro, Vietnamese coriander, fresh chilies, and soy sauce. Extra toppings of pork cake and meatballs could be added for extra money, or it was served as just bland bread and soy sauce if one was on the tight budget. 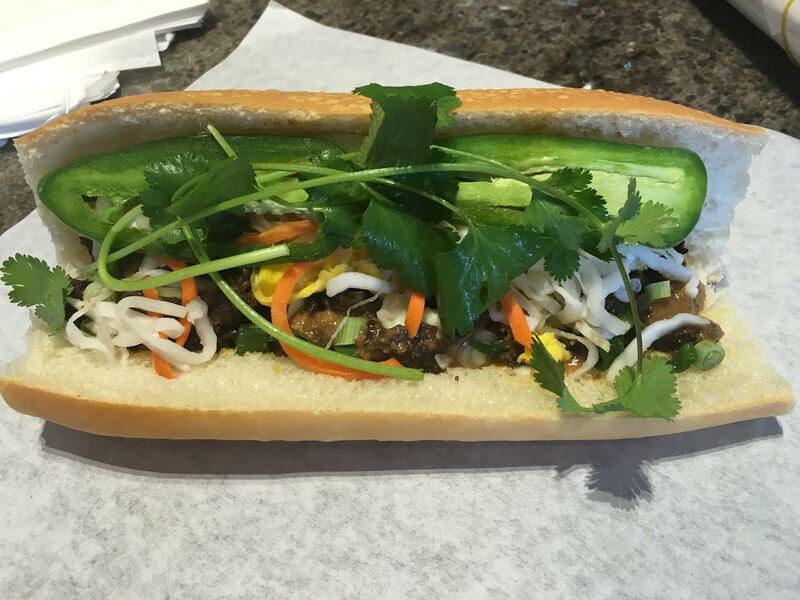 Today, bánh mì is much more accessible and affordable. 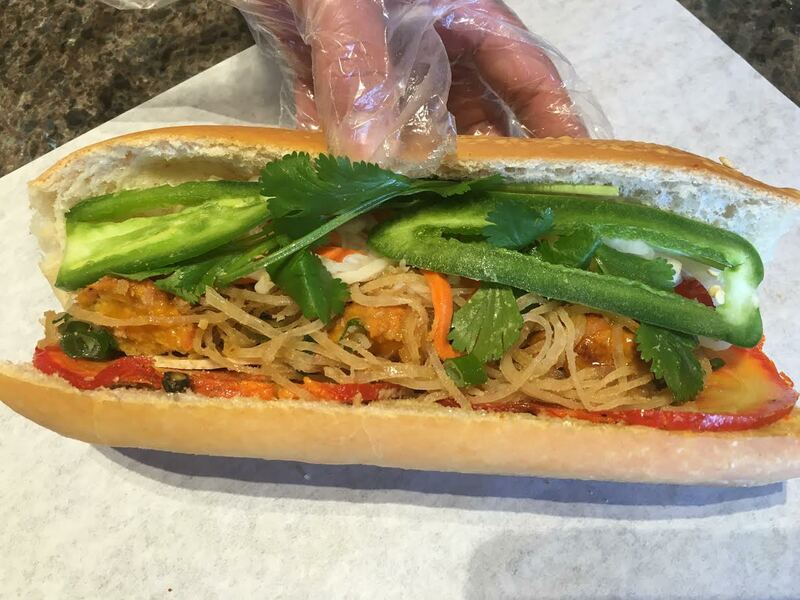 California’s Little Saigons have bánh mì shops on every corner. The recipe resembles that of Saigon’s style, which includes bread, pate, mayonnaise, pork cake, char siu (BBQ) pork belly, giò thủ (pork fatty cake made of pork snout, ear and skin), daikon and carrot pickle, cilantro, jalapenos, and soy sauces. 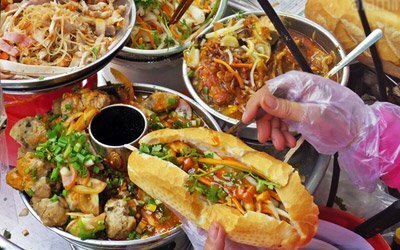 Diners also can customize bánh mì to their liking by choosing toppings such as grilled beef, BBQ chicken, pork meatballs, fish, eggs and such. However, different from the French baguettes, which are made mostly of wheat flour, makers of Vietnamese bánh mì mix rice flour and wheat flour to form the bread, reflecting the fundamental fabric of Vietnam’s culture and agriculture in rice. I set out to taste as many of these airy baguettes with meat or vegetable fillings as I could in as many bánh mì shops as I could find in Little Saigon in Southern California, sampling the dish from locations including Bánh Mì Chè Cali, Tip Top Sandwich, Lynda Sandwich, Top Baguette, Lee’s Sandwiches, Saigon Bakery, Au Coeur de Paris, and Boulangerie Pierre & Patisserie. The list goes on. 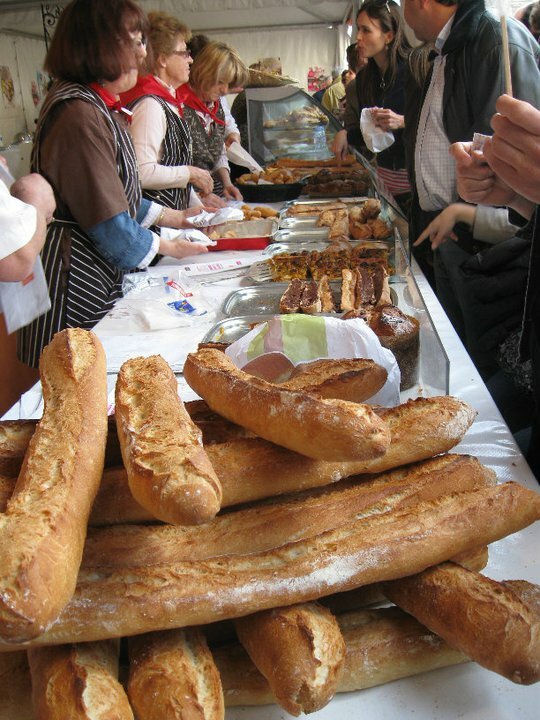 I also have eaten at many of the baguette shops in France from Nice to Paris and even attended a bread festival in Paris to hunt for that pleasure of being satisfied with a warm-crunchy-juicy-spicy-sweet-savory-fatty-tangy-aromatic-fresh bánh mì, one bite at a time. Despite eating delicious bánh mì from Little Saigon to Paris, from places of bánh mì’s origin to places of bánh mì‘s creation, the flavor of my childhood remains a distant memory. While I now can afford to buy and eat all the bánh mì my heart desires, the pleasurable satisfaction derived from that one bite of fresh bánh mì from home has yet to be found.